Personal development, whether referring specifically to one’s own self-development or to the development of people within an organisation, focuses on the improvement of self-awareness and self-knowledge towards actualising aspirations and potential. These days, most businesses will use a combination of personal development approaches including training, coaching and mentoring. Often referred to as the “soft skills”, business leaders and HR personnel know the value of personal development, yet in times of economic crisis, it is often one of the first budgets to be cut. It is, however, also the area where a small investment can make a really big difference. Personal development is essential to the renewal of creativity and inspiration, for the individual and therefore within the organisation as a whole. It is all about growth… and just like everything within nature, simply put, if you are not growing, then you are dying, and there is not much else in between! This commitment to ongoing personal development is fundamental to Humanistic Neuro-Linguistic Psychology tm. 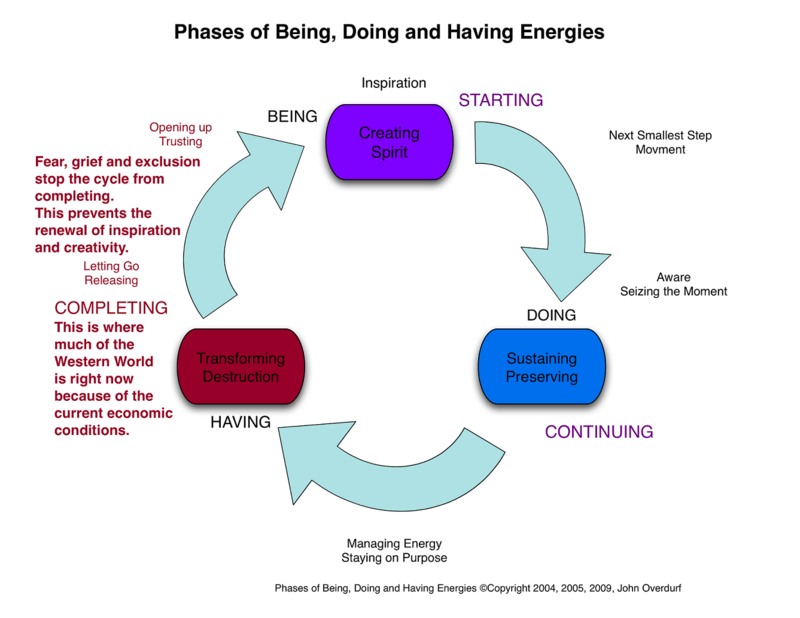 Of particular relevance is the Phases of Being, Doing and Having Energies model, created by HNLP co-founder, John Overdurf. 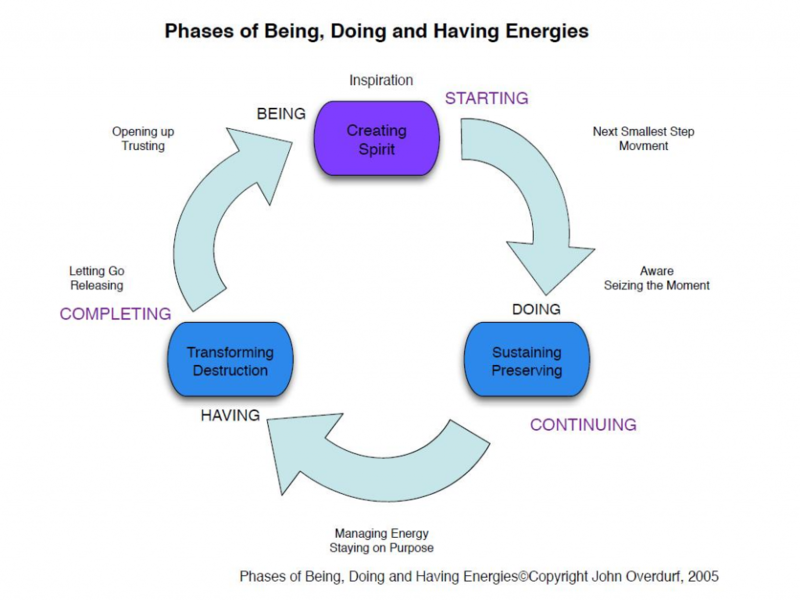 Authentic personal development focuses on the “being” aspect of the model. Every goal we set, or action we take, is really to obtain a certain feeling or state of being. Why else does a person want that job or relationship or car etc? Because they believe they will feel better in the having of it. In setting these types of goals, not only do they deprive themselves of those good feelings now (known as the “I’ll be happy when…” pattern), but also those very states of being are often required for successful completion of the goal. For example, they want the dream job because it will boost their self-esteem, yet confidence is the essential factor to successfully securing that job. So authentic personal development is about first recognising how you want to “be” as a person and then taking action and doing things that align with that vision. This creates the results you want, with an abundance of good feelings in the process. In this model, in order for ongoing evolution and continued growth, there will naturally come a time of completion of the cycle. This has been a shared experience for most of the Western World recently due to the economic conditions, and those organisations that have thrived have been the ones that were willing to let go of the original plans and try something different. The same is true for people. The individual will reach a point when in order to take their personal development to the next level, they need to be able to let go of certainty to allow for the renewal of energy and inspiration. When we hang on too tightly to what we already know and have, either through fear or habit, we box ourselves into an ever-decreasing comfort zone. Authentic personal development is a willingness to face the unknown, take a risk and embrace the uncertainty of not knowing all the answers, long enough for something new to emerge. Everything in life will continue to evolve, and as we commit to our own personal development, we get to grow into a whole new way of being too! 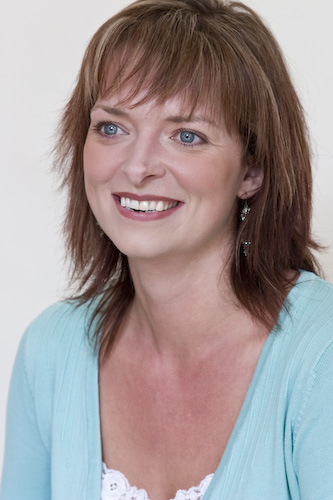 Tiffany Kay is a Certified Coach and Trainer of Neuro-Linguistic Programming (NLP), Humanistic Neuro-Linguistic Psychology (HNLP)™ and Ericksonian Hypnotherapy. 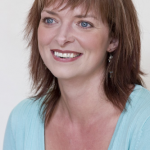 Posted in: coaching, Inner Game, Managerial Skills, NLP, Personal Development.